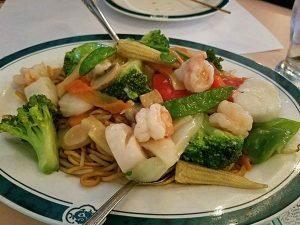 I recently tried New Century Chinese in Saint Johnsbury while waiting to attend an event at St. Johnsbury Academy. We didn’t have a lot of time so were looking for a quick meal. I was happy to find New Century Chinese. The restaurant was clean, comfortable, and inviting. Many American Chinese restaurants are fast food joints. Food comes out quick, or for takeout, and often the restaurant itself is lack luster. Banquet tables and chairs, white walls in bad need of painting, and a host of cheap décor items greets those looking to eat in. That was NOT the case at this Chinese restaurant in Saint Johnsbury. The building used to house a steak and seafood restaurant. 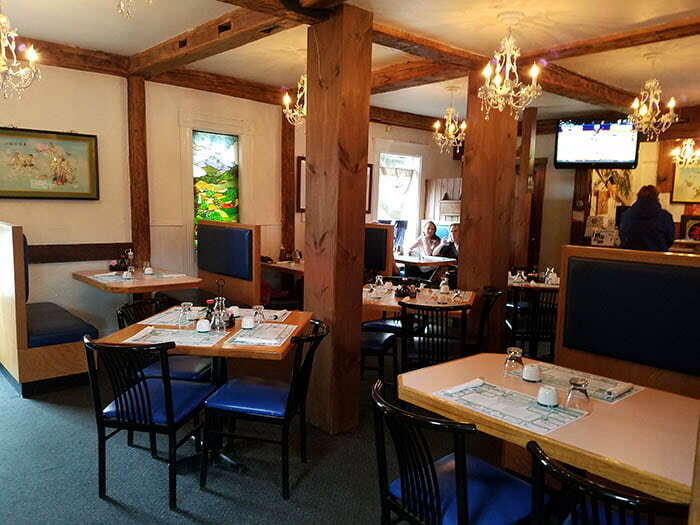 Inside diners are met with exposed wooden beams, wood work covering the walls, inviting booths, and even stain glass window that look original to the building. Tastefully hung throughout the space are Chinese lanterns, reminding you of the cuisine you will be eating. Upstairs is an extra space for large parties, gatherings, or can be reserved for meetings or birthdays. 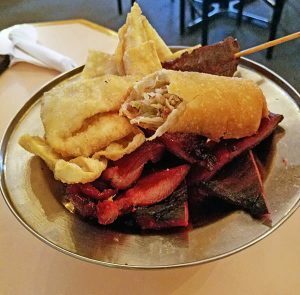 The menu is a standard American Chinese menu, featuring many dishes you can find at similar establishments. We ordered an appetizer sampler that included an egg roll, beef teriyaki sticks, bbq ribs, and a few crab rangoons. I was pleasantly surprised with this collection. I love crab rangoons, but have found at many restaurants these are mostly cream cheese and have little flavor. The rangoons here were more like those I have had made to order – and I ate them all. Everything else on the platter was well cooked, nothing was tough or tasted old/overcooked so I knew it hadn’t been sitting under a warming light or made ahead. For dinner, my son and I split the seafood lo mein. Filled with shrimp and scallops, small corn, peppers, broccoli, mushrooms, carrots, and water chestnuts with lo mein noodles, we thought this was a good compromise between all of the things we wanted from the menu. Everything was cooked well and not overly salty. I even indulged a little with a drink from the bar, a scorpion bowl. Everything came out quickly and our waitress was very attentive. Out of all the area Chinese restaurants, this one really has the best atmosphere. 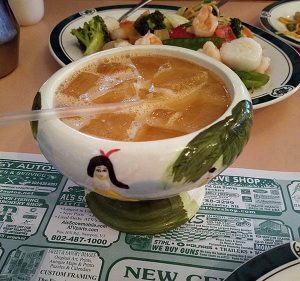 Normally, on this blog, we try not to feature chain style restaurants and so I have stayed away from Chinese restaurants in the area. But, after dining at New Century I really wanted to share the uniqueness of space that I found here. First, the building looks like an old house from the outside. Upon walking in the door, you are met with rough hewn exposed beams, a rustic wooden staircase, and inset rounded booths that look cozy and inviting. 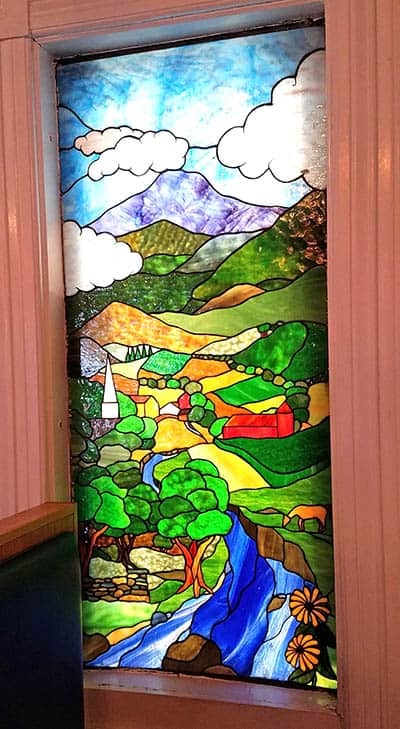 Another feature of the main dining space is a stain glass window, common in many St. Johnsbury buildings from the same time period – though based on image on the window it most likely isn’t original. These touches give the space a sturdy and comfortable feel – unique to this Chinese Restaurant and steps above the dining spaces of similar establishments. 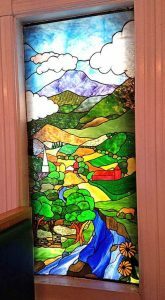 Off the main dining room, running along the front of the building, is an enclosed porch with a glass front. I imagined eating here in the summer with sunlight streaming in. Though it faces the road, and doesn’t provide a great view, it is a great way to make use of good weather while enjoying quick mid-week lunch, or a leisurely meal with family and friends. If you’re in St. Johnsbury for an event and are looking for a nice place to get a fast meal, I recommend giving New Century a try.